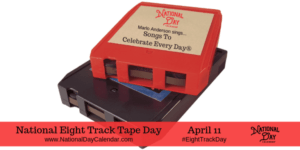 Ok, I remember 8 tracks- had a stereo with an 8 track player- my Aunt had a collection of 8 tracks……Thanks for the memories!! Oh sorry Pet Day over took 8 track day! *tear* (seriously I wish each day had one thing not like 10 things associated and be recognized with it! Geez, who can keep up?!?!? !